Sen. Joe Biden (D-Del.) speaks during an “Opportunity 08″ issue forum at the University of Nevada, Reno Wednesday, August 22, 2007. The issue forum was sponsored by the Brookings Institute and UNR. Biden’s Credentials: The Delaware Senator, elected to the U.S. Senate at age 29, was once the rising star of his party, known for his quick mind and gifted speaking ability. A staple of the Sunday morning talk shows, he’s one of his party’s most knowledgeable thinkers on foreign affairs. On Sept. 10, 2001, for example, he made a speech about the next great threat facing America: international terrorism. His plan for Iraq is to federalize it and given more autonomy to Shiite, Sunni and Kurdish areas. Biden has been part of a number of high profile, dramatic Senate hearings during his career, and early on he understood the power of a televised hearing with the onset of 24-hour news. Biden was a cogent critic of the Reagan administration during the Iran-Contra matter and helped engineer the hearings on the defeated nomination of Judge Robert Bork to the U.S. Supreme Court. Place of Birth: Scranton, Pa. Notable: Biden — who travels 100 miles by Amtrak between Washington, D.C., and his home in Wilmington, Del., every day when Congress is in session — is one of the Senate’s better golfers with a 7.4 Handicap Index. Biden ran unsuccessfully in the 1988 presidential election. Biden on the Issues: A look at where Biden stands on the issues and how he has voted. Nevada Contributions: A breakdown of Biden’s financial contributions from the Silver State. State by State Contributions: A breakdown of Biden’s financial contributions across the U.S.
Biden's MySpace Page: Read Biden's profile information and leave a message. Biden's Facebook Page: Read Biden's profile information and leave a message. Biden's Flickr Page: View Biden's photos from the campaign trail. 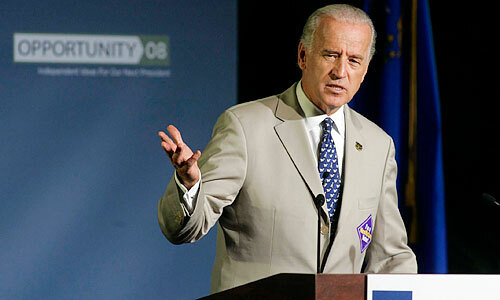 Biden's YouTube Videos: View Biden’s latest political videos. Biden's Blog: View Biden's official campaign blog. — Las Vegas Sun writer J. Patrick Coolican, web content editor Andy Samuelson, and intern Jenna Kohler compiled this report.